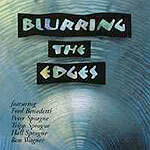 CD review: "Blurring the Edges"
Blurring the Edges is Del Mar guitarist Peter Sprague's latest vehicle. He's joined in this band by brother Tripp on flute and keyboards, father Hal on bongos, fellow guitarist Fred Benedetti and drummer Ron Wagner. Like earlier Sprague projects, Blurring the Edges combines jazz instrumentation and improvisation with Latin rhythms and structure. The musicianship is, of course, top-notch, and the quintet plays with enthusiasm. Plus, the songs, all originals, are well-written and interesting. Still, Blurring the Edges has a tendency to play it safer than past Sprague efforts, and there is too little sense of exploration or adventure. The musicians are, perhaps, too comfortable with one another and there seems little of the creative tension that has marked Sprague's career.